The Tail Hair is part of the Arabian megaconstellation of the Lion (al-asad). It is the coarse tuft of hair at the end of the Lion’s tail, which was pictured to be above the Two Haunches (al-warikan). 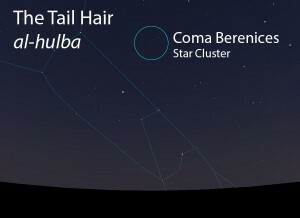 The Tail Hair (al-hulba) as it appears in the west about 45 minutes before sunrise in early March. Sky simulations made with Stellarium. 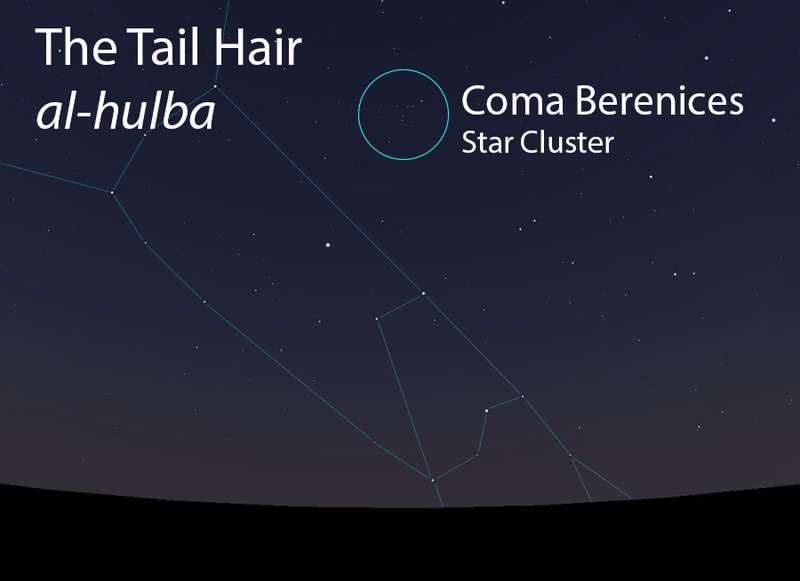 A cluster of widely-spaced stars that comprise the bulk of the modern constellation Coma Berenices. The Tail Hair of the Lion does not figure in the calendar of the rains stars. The Tail Hair of the Lion is not one of the lunar stations. The Tail Hair is part of the Lion (al-asad, الأسد) folkloric celestial complex, which extends from the Two Forearms (adh-dhira’an, الذراعان) to the Two Shanks (as-saqan, الساقان).